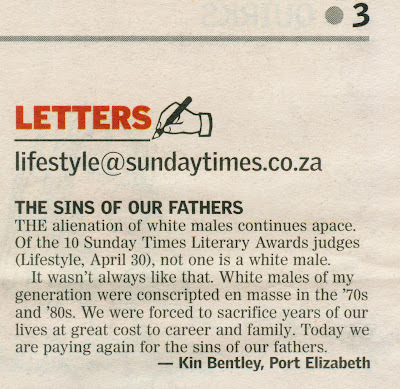 It is mid-2006 and I am still barred from writing articles of a political nature for the Herald in Port Elizabeth, where I first started working as a political reporter on its sister paper, the Evening Post, at the height of the anti-apartheid struggle in 1984. 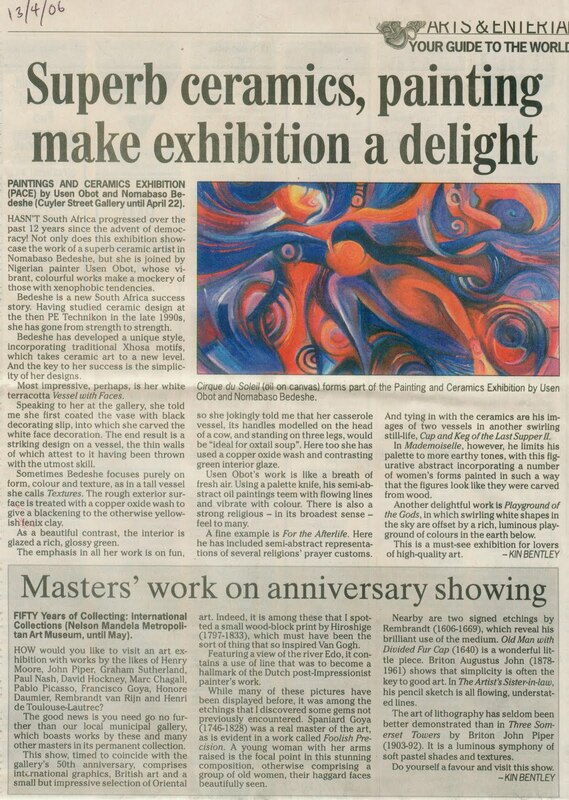 Anyway, my art crits and the odd book review keep me busy before I go to work each evening as a sub-editor. 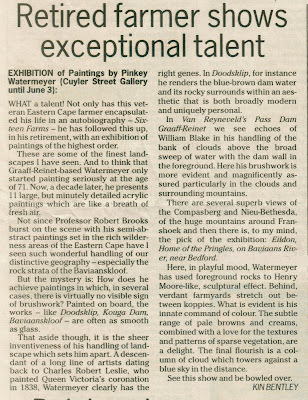 This posting does, however, include one little political missive, which I managed to sneak into the Sunday Times's Lifestyle supplement. 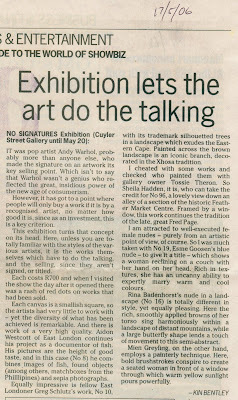 Tim Hopwood has helped put photography on the map as an art form in Port Elizabeth. 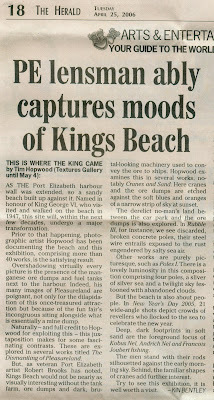 I reviewed his exhibition on King's Beach on April 25, 2006. 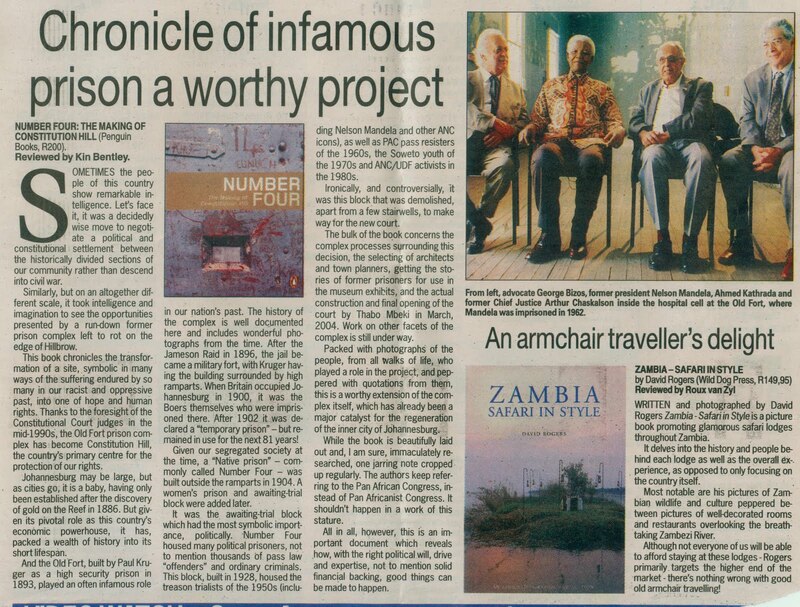 This is my review of Number Four, a book about the establishment of the Constitutional Court. It appeared in the Herald's TFIG supplement on May 5, 2006. Don't you love that picture of Madiba and colleagues, taken from the book? 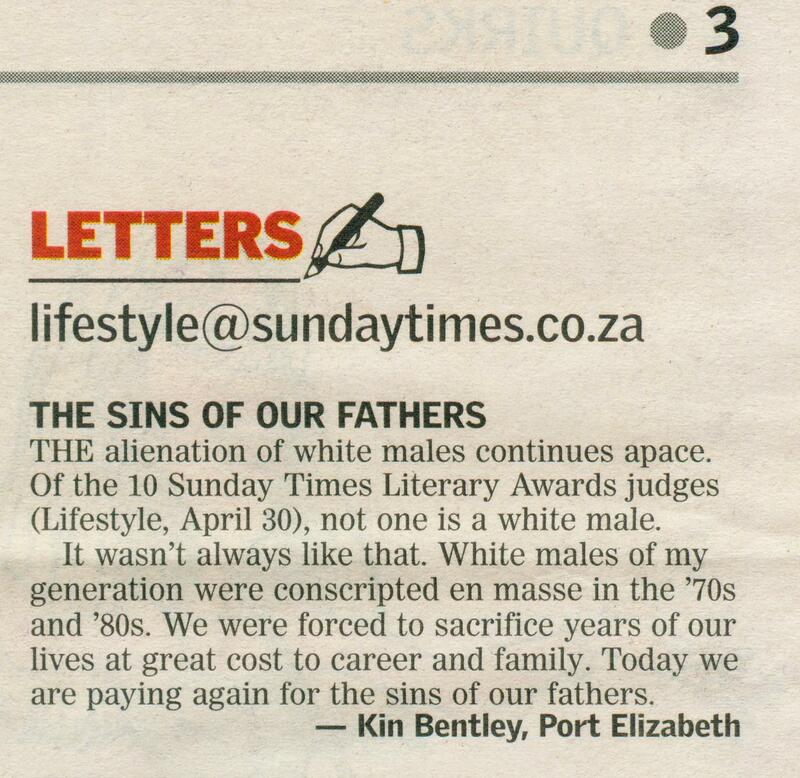 This letter appeared in the Sunday Times's Lifestyle supplement on May 7, 2006. 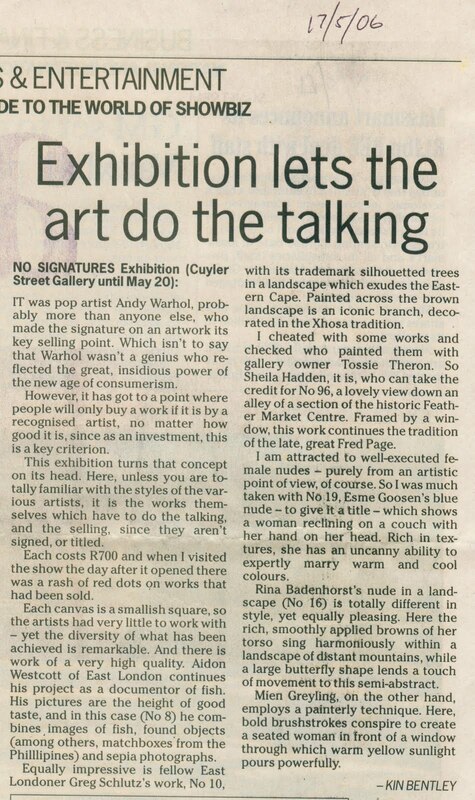 Cuyler Street Gallery owner Tossie Theron held an annual No Signatures exhibition. 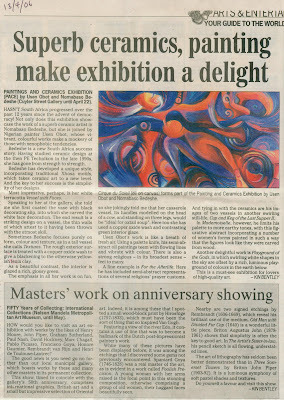 This crit appeared on May 17, 2006. 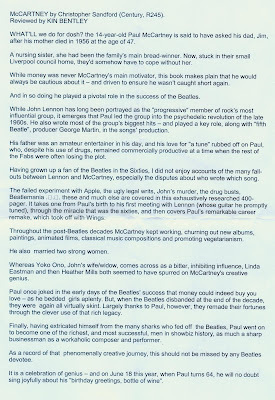 My review of a book on Paul McCartney, which appeared in TGIF on May 26, 2006, was badly hacked in the sub-editing process. 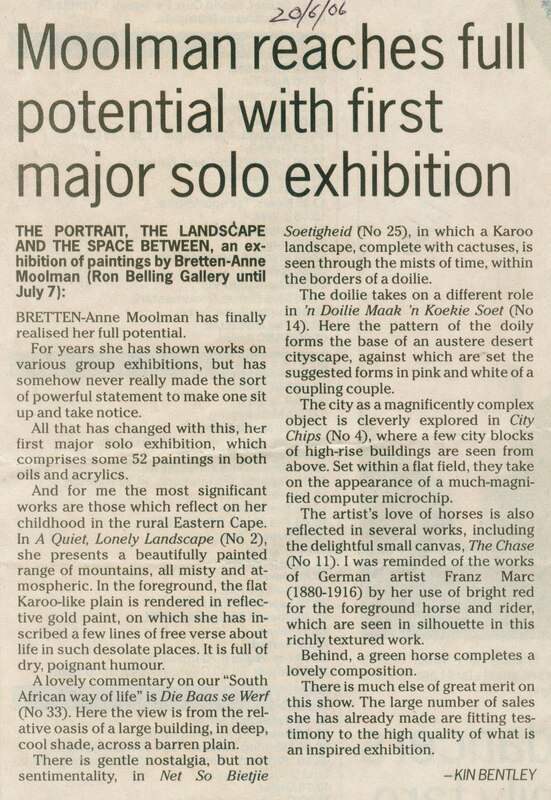 I include a print-out I made of the original, below. 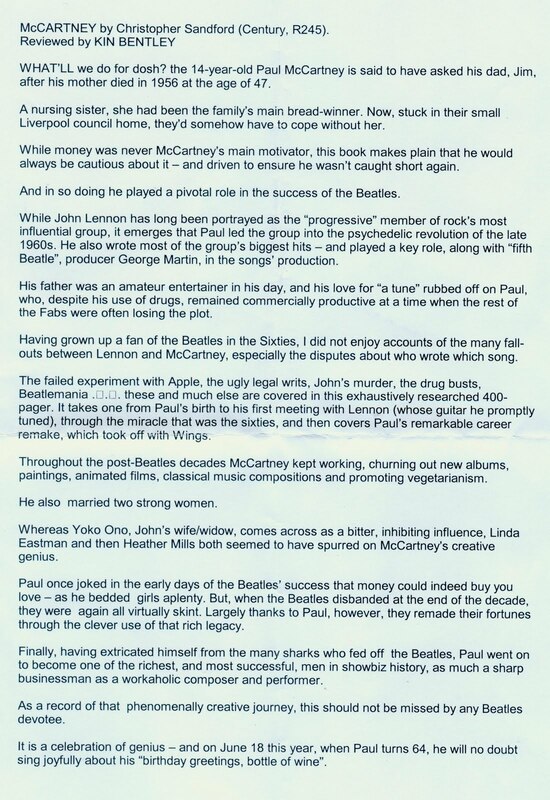 My original review of the McCartney book. 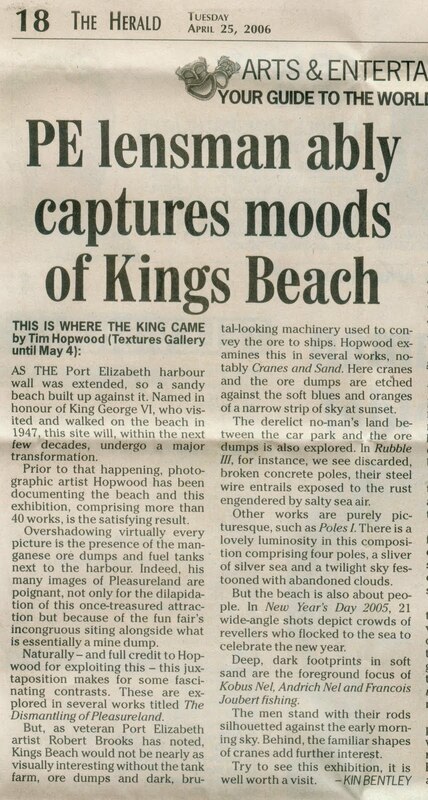 It is interesting to note how editing can distort what was written. 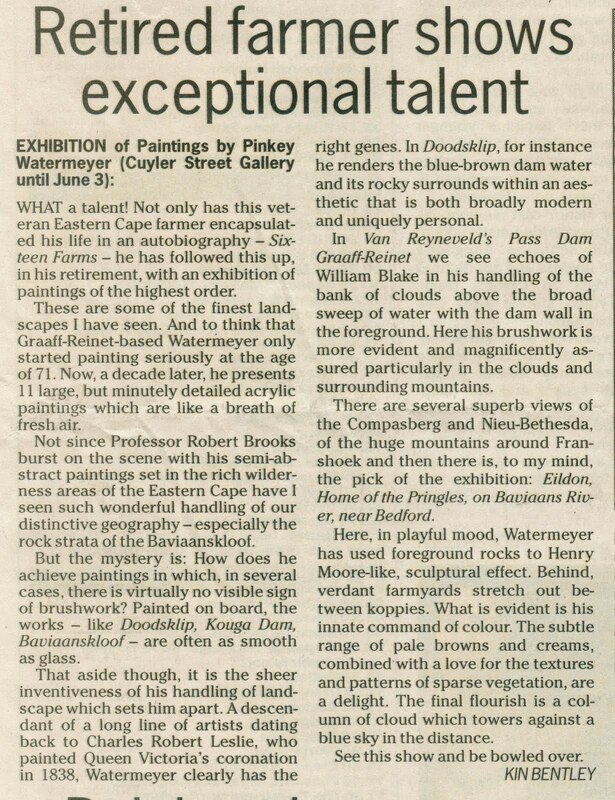 My review of an exhibition by Pinkey Watermeyer, who wrote the book Sixteen Farms about rural life in the Karoo, appeared in the Herald on May 30, 2006. 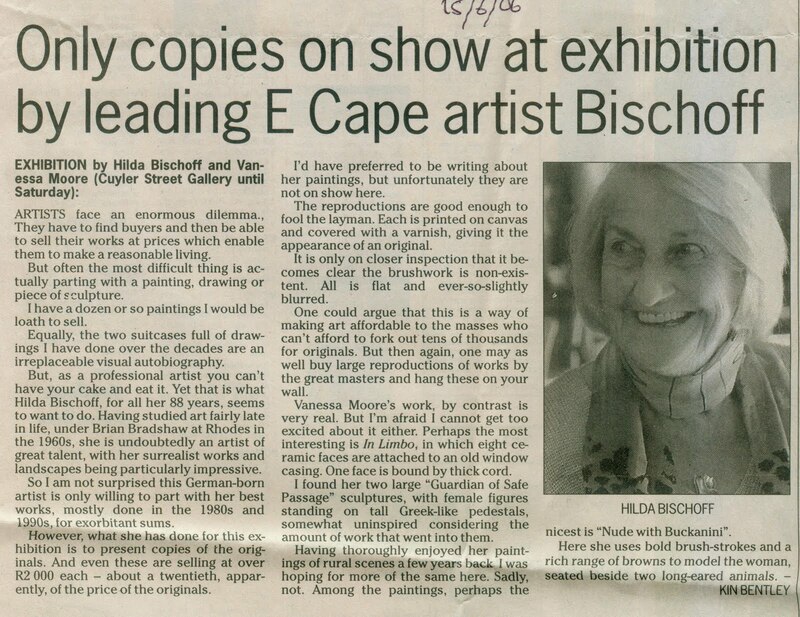 Another veteran artist, Hilda Bischoff, I am afraid, took a bit of flak in this review from June 15, 2006. 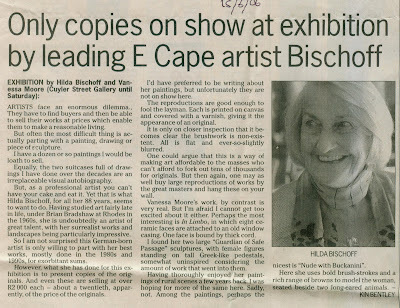 Also exhibiting was Vanessa Moore. 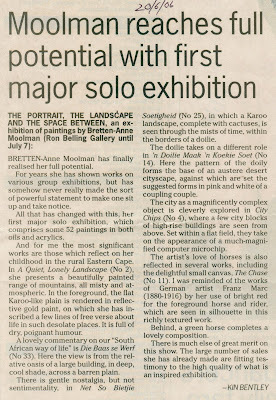 It was a pleasure finally to write a glowing review about an exhibition by Bretten-Anne Moolman. 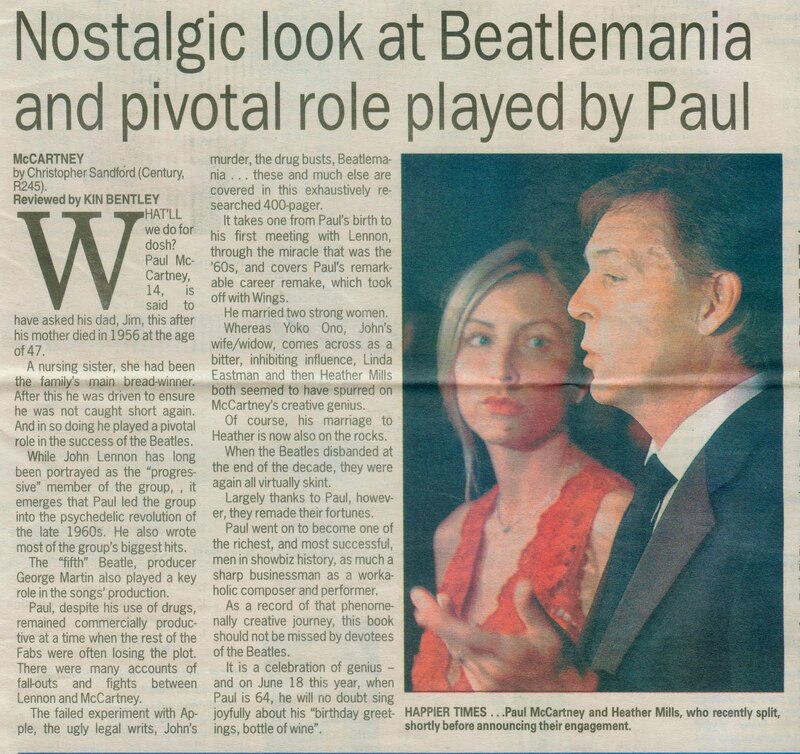 This appeared in the Herald on June 20, 2006.